Mongoose, Hippos? Yes! Ep 30? Soon! 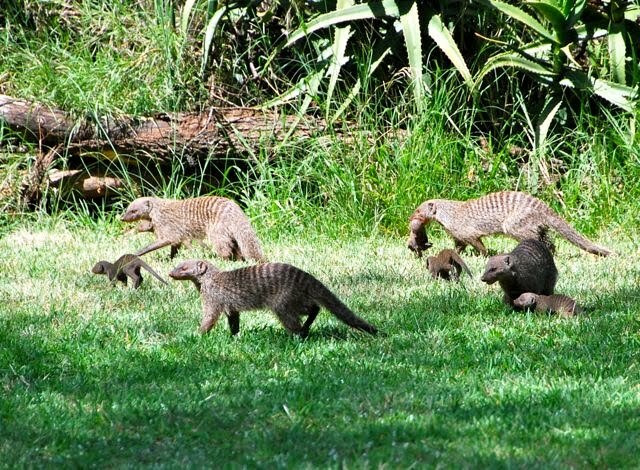 Two new Africa pictures today: Some banded mongoose (see the baby going for a ride?) 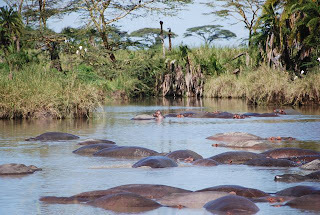 and just a few hippos. I'm subbing all day today then heading up to the mountains for the weekend with my sister and friends. But I'll still be getting Episode 30 all ready for you. Just three more episodes left. I can't believe it's wrapping up so soon! Do I even need to write anything here? Doesn't the title say it all? Well, I can tell you that these elephants weren't fighting, they were playing--so cute! 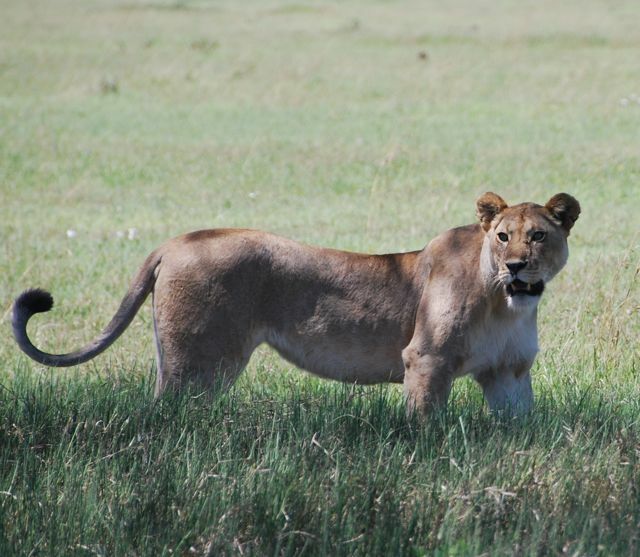 I took their picture in Manyara National Park. 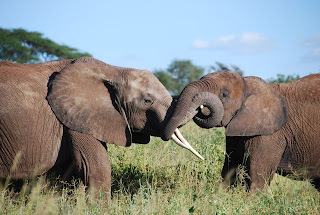 I have lots of elephant pictures, but this was one of my favorites. 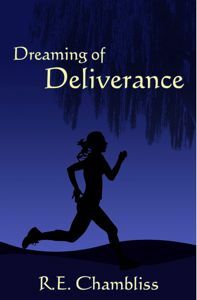 As for episode 29, in case you don't have a link to the podiobooks.com listing of Dreaming of Deliverance, here it is! I'm finally going through my Tanzania pictures. Check out this gorgeous girl! Episode 29: for those who want it ASAP! 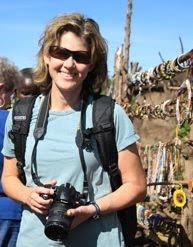 Here I am in Africa--actually visiting the Maasai village. You can see the trinkets for sale behind me. 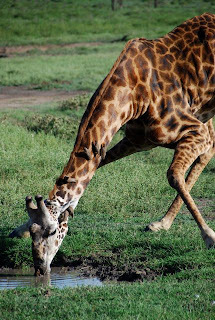 I'm going to try to get more Africa pictures up. It's been almost a month since I've been back--I think it's time! Okay, now 28 is live on podiobooks.com! So you don't need to go to the REchambliss.com link to listen to it. I was hesitant to put it there, because the site needs a lot of work. But I had it ready, and it sometimes takes a day or two after I've finished it before it can go live on podiobooks, so I thought something might be better than nothing. But it's the same audio file, so you don't need to listen to it in two different places. I was telling someone the other day about how even though I have perfectionistic tendencies, I've had to relax some because otherwise I wouldn't be able to get the episodes out regularly. The mom-thing limits both my time and my ability to record, since I don't record when the kids are home. 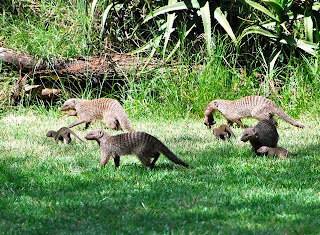 Anyway, I've been wanting to improve the web site forever, but haven't had much of a chance to do it. Now that we're so close to the end (just 4 more episodes), what I think I will do is post some bonus behind the scenes sorts of commentary on REChambliss.com after the whole book is live. I'd wanted to do them as I went and have the podcast version of Dreaming of Deliverance available in two places, but it all proved to be too tricky for my meager web master skills, and I thought having them on podiobooks took priority! Today is Monday. The kids are back in school and I wasn't called to sub. So I might record episode 29. Or I might clean the house and go to the grocery store. Decisions, decisions! I know which I'd rather do, but sometimes duty calls! It's not up yet at podiobooks.com, but if you want to hear it sooner, I've uploaded it to REChambliss.com. This was a longer episode, but I wanted to give you the whole chapter. My 3-year-old niece has been staying with us so I haven't had a chance yet to record for episode 28, but tomorrow is the day! We have just 5 episodes remaining! So I'd been hoping to be able to announce that Episode 27 of Dreaming of Deliverance is live. But it's not yet. I finished it and uploaded it Saturday evening, but it hasn't been posted yet at podiobooks.com. Soon I'm sure! Thanks so much for your patience! But if you want to hear an interview where I talk about some of the background and inspiration for Dreaming of Deliverance, check out the Runners Round Table podcast from last week. I had so much fun talking with Joe, Toni, and Leslie. They were very welcoming and had so many great questions. Among other things we discussed the fact that unlike Lindsay, I've never been incarcerated. That part of DoD came from research and my imagination. And of course there's Kenn Crawford's Dead Hunt! He just released episode 8. Have you been listening? Things are getting dicey in Margaree. And it's doing really well on the podiobooks.com charts, which doesn't surprise me at all. It's so well-produced and is such a creepy story! I sure tried my best to do it justice with the narration. Finally, I'm hoping to have some sort of Facebook presence soon. It will be another way that people can communicate with me, as well as with each other about Lindsay, Joel and Trae. I'm not sure if it will be a regular profile or a fan page, but I'll let you know once it's ready to go. Do any of you have a preference there? Next week I'm going to be on the Runners Round Table podcast, to talk about runners in fiction and Dreaming of Deliverance. I'm really looking forward to it!